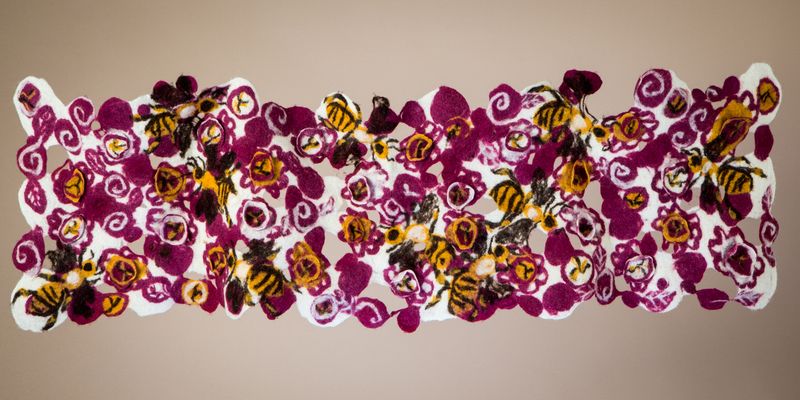 This piece is a close up of a primrose garden with bees collecting pollen. I chose to put many bees in the primrose patch, so the viewer would look at them as beautiful objects instead of something that was scary or disgusting. Each bee is busy collecting pollen, which is stored in their back leg knee baskets. These are the worker bees, which are the females. Any pollen on the rest of their bodies is deposited on other flowers during their collecting rounds, where a small amount can rub off on the pistil, resulting in cross pollination. Almost all of the world’s food supply depends on cross-pollination, done by a small variety of pollinators. Our pollinators are at great risk of disappearing because of pesticides and factory farming methods. The beauty and awe of this piece, in combination with organic fiber and dye, is a close up view of what we are loosing at an alarming rate because the general public is barely aware of the damage to the climate from factory farming. 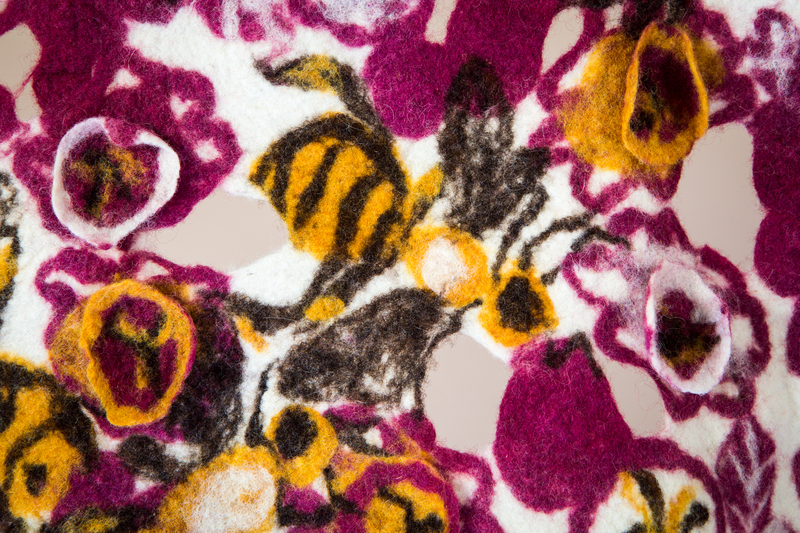 The reality that factory farms kill more than they produce from the use of pesticides and herbicides that kill everything in their path, harm our pollinators, the plants they eat, the wool used to make this piece and the plants used for the dyes. Factory farms also use enormous amounts of fossil fuels, produce detrimental amounts of methane, and are huge contributors to climate change. Be conscious of the origin of your food and clothing. This piece is dyed with cochineal, vegetables, and color grown wool.